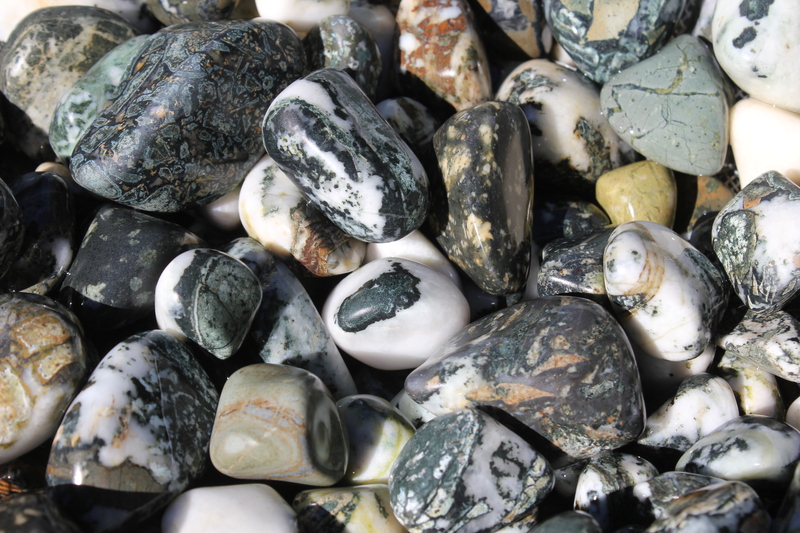 A batch of Dallasite tumbled stones after 1 day of 220 grit in the Thumler UV10 Rock Tumbler. I’ve had plenty of loads go through my Lortone rotary tumblers already, but I’ve decided to use the rotary tumblers only for coarse grind and shaping, so I’ve got a bunch of 25% finished rocks. I put together a batch of mostly Dallasite to do my first run in my vibratory rock tumbler. It took a long time and a few repeat coarse grinds in the rotary tumblers to get enough crack- and pit-free stones for a vibratory load. 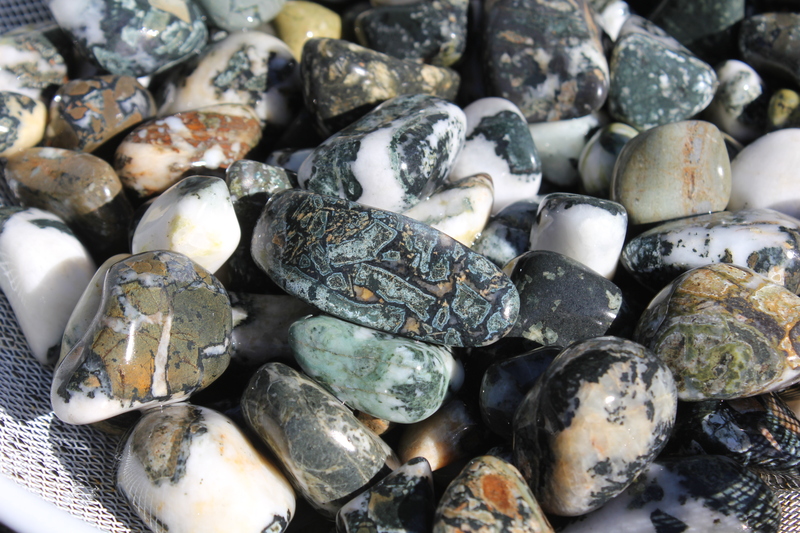 Another angle at the batch of Dallasite jasper halfway through the stone tumbling process. The point of using a vibratory tumbler at this stage is to speed up the process. Rotary rock tumblers grind stones down and shape them well, but take a long time. Each step in a rotary rock tumbler takes at least a week. With the vibratory tumbler, steps take just a couple or few days. This method allows me to grind rocks down for a week in the rotary tumbler and then transition to a faster finish to polish in the vibe. A tumbled Dallasite stone halfway through the polishing process. 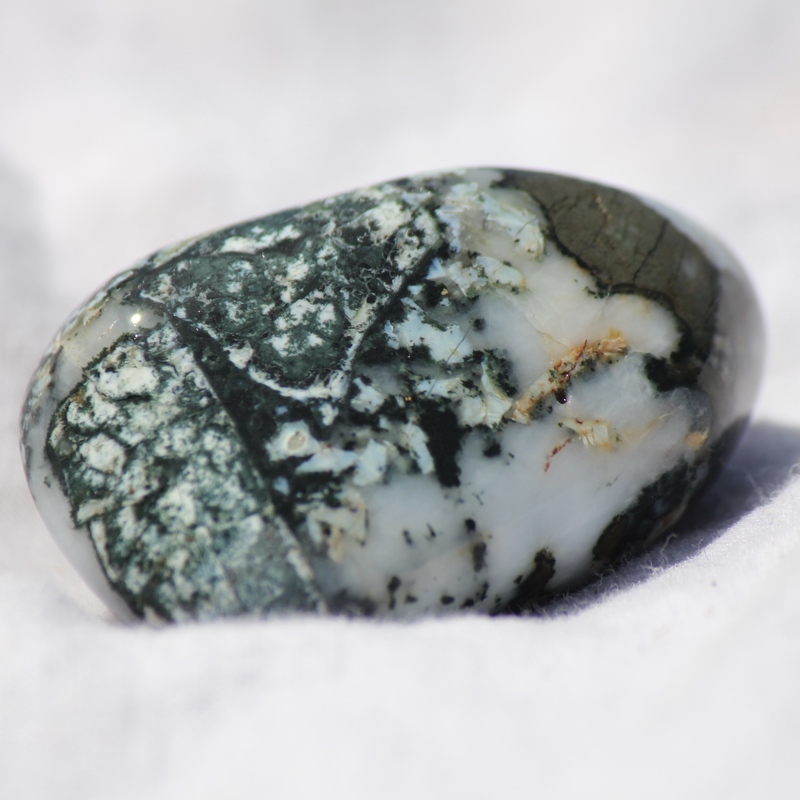 Another partially tumbled Dallasite stone. They need to be photographed wet until they’re fully polished, as the prior stages leave a haze on them. This one developed a pit in the middle. I’ll have to inspect it more closely to see if it’s good to go to the next stage or if it needs more work in the coarse grit. Last shot for now. 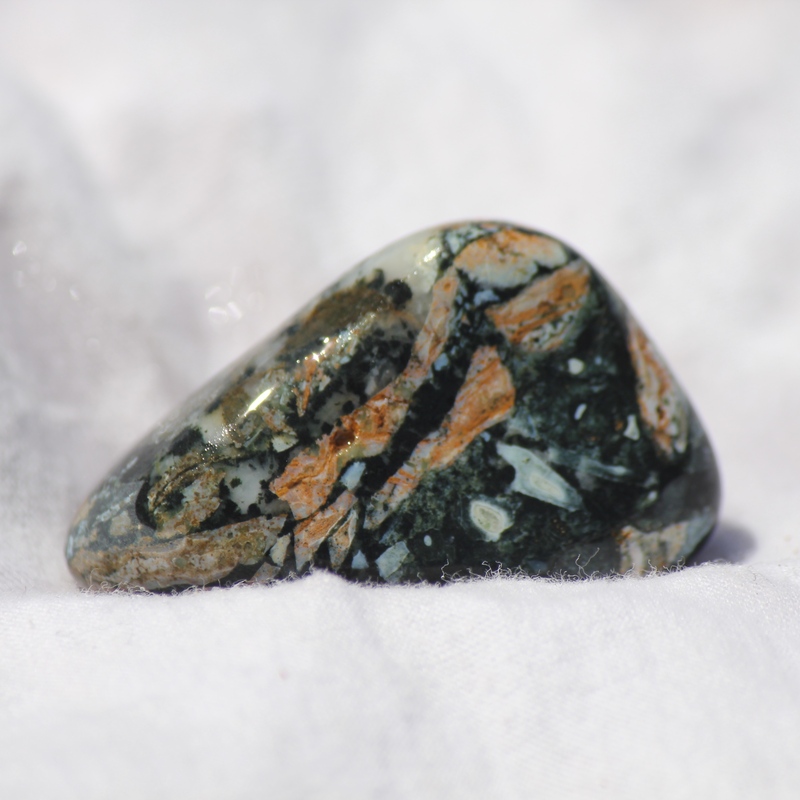 A Dallasite tumbled stone halfway through the polishing process. Notice a small pit on this one too. 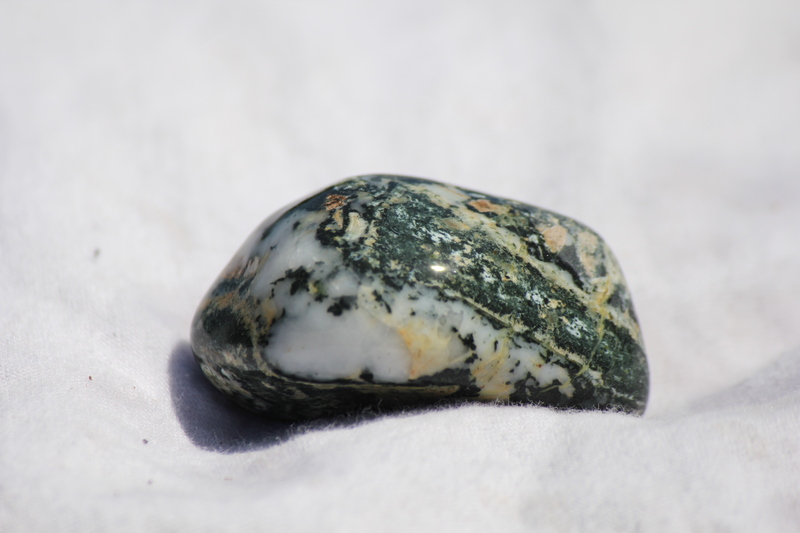 As a jasper breccia made up of materials of different hardness levels, Dallasite is prone to undercutting in the polishing process, which means that some sections crack, pit or fall out. I went through a few coarse grit loads to get enough good stones for a vibratory load, and as you can see, the constant pruning and re-tumbling process will continue the whole way. Several stones from this batch will have to go back to coarse grit, I suspect.